The "working" hydraulic arm is a great addition. The whole model is outstanding. I've been thinking about the landing gear. I would have like it to be retractable. But given that the original model looks like the gear is supposed to piston out, this doesn't seem likely, so I'll settle for having closable doors and removable gears if I can make it work. 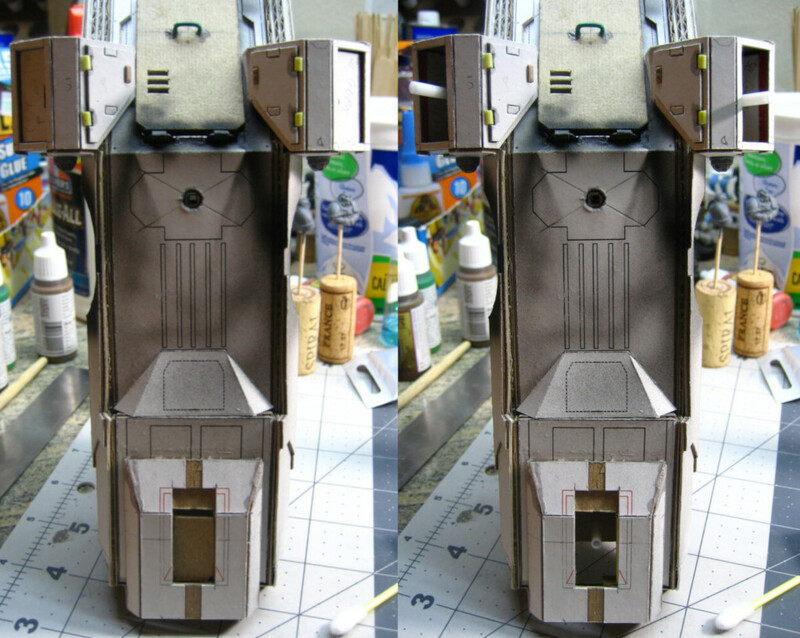 The rear legs are housed in very oddly shaped external boxes. The feet of the gear form the doors. 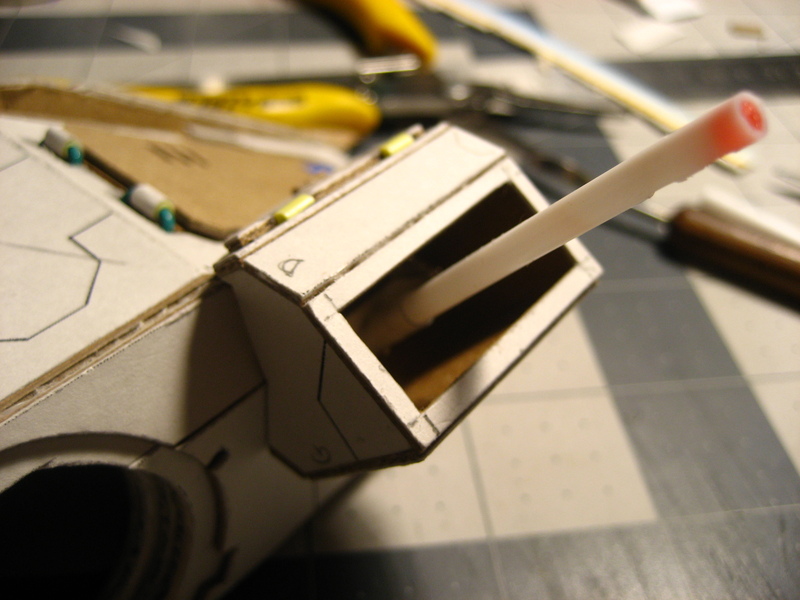 So what I have done is to glue a short stub of plastic pipe (drinking straw + lollipop stick) into the main hull, then the landing gear box slips over top of that. For the front gear, it seems to have to have retract into the narrow space between the two front cannons. 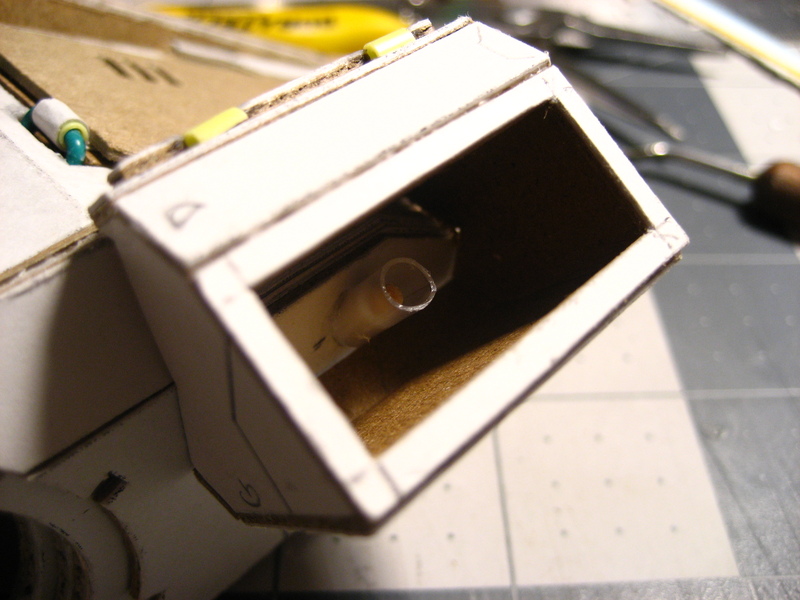 For that to happen, the stub has to go inside the nose, underneath the cockpit. 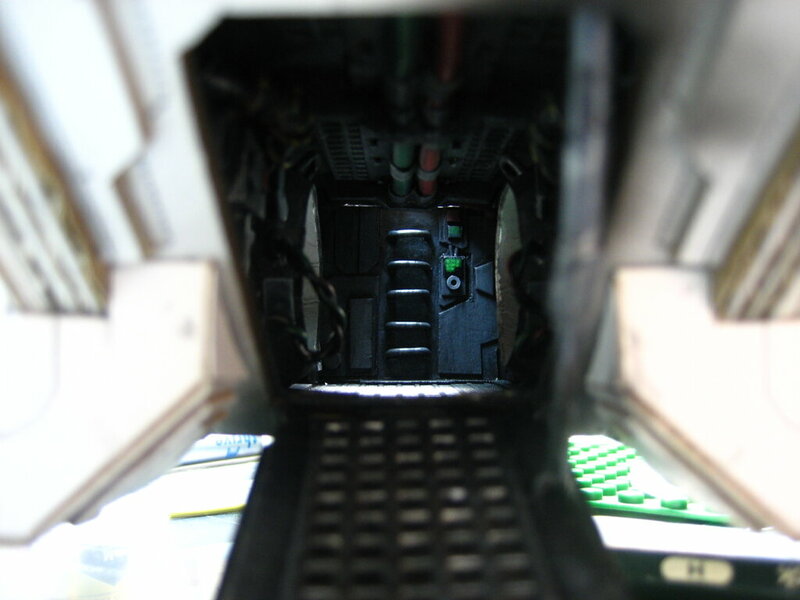 So I first performed some surgery to the bottom of the cockpit to give me some space, then added the lip that goes underneath the front cannons. The lip is custom built, since the template's version is... just plain wrong. I've been away for a while, but back now and starting to make progress again. 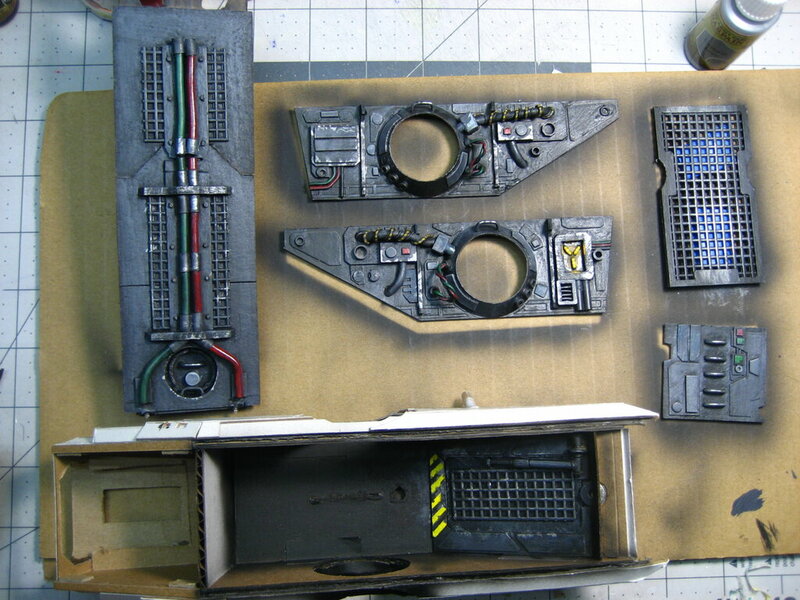 This first shot shows how the interior will fit together: once painted, all panels will be glued into place. The rear ceiling/top will be glued in too. 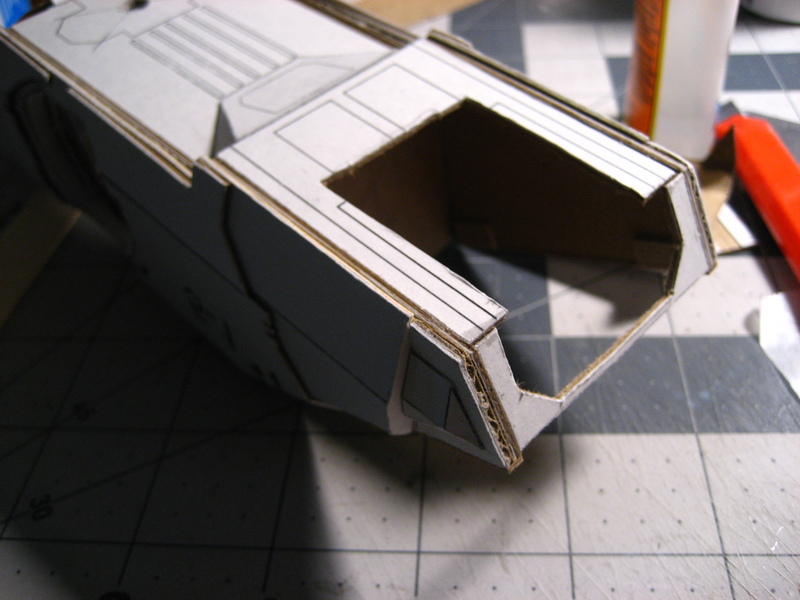 The front ceiling/top will be removable. 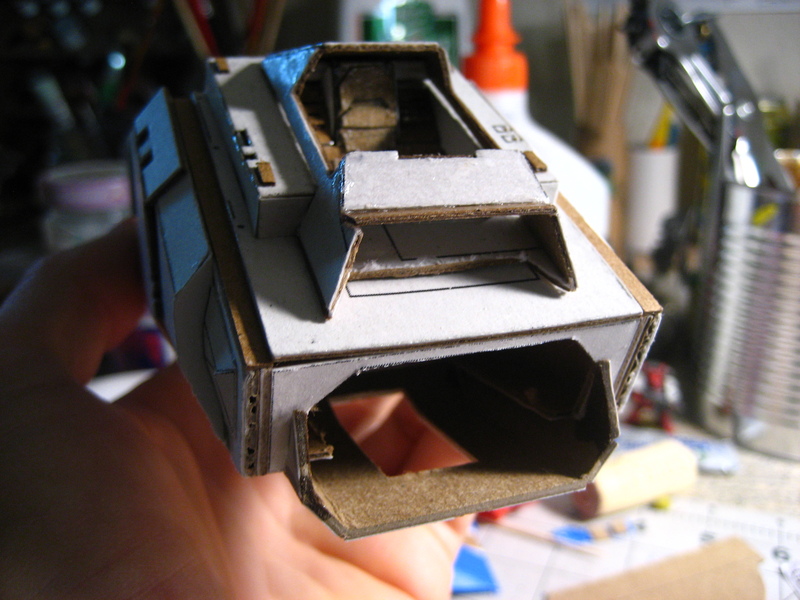 You can see that I'm deviating (again) from the official model a bit - I don't have a separating bulkhead between the two ball turrets, plus I have built a kind of a socket for each ballturret. 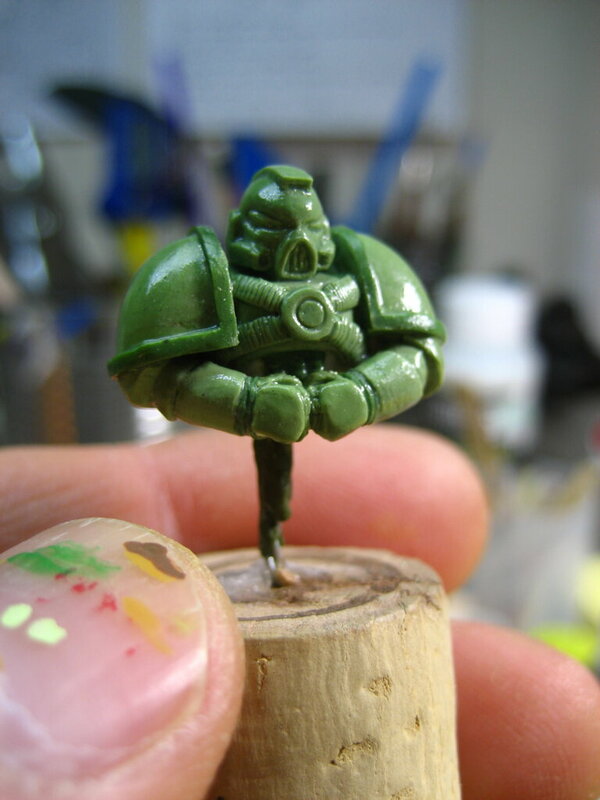 Oh, and a ship needs a crew So here is the start on the sculpt, using a 24 gauge wire, coated in greenstuff and bulked out with kato clay. 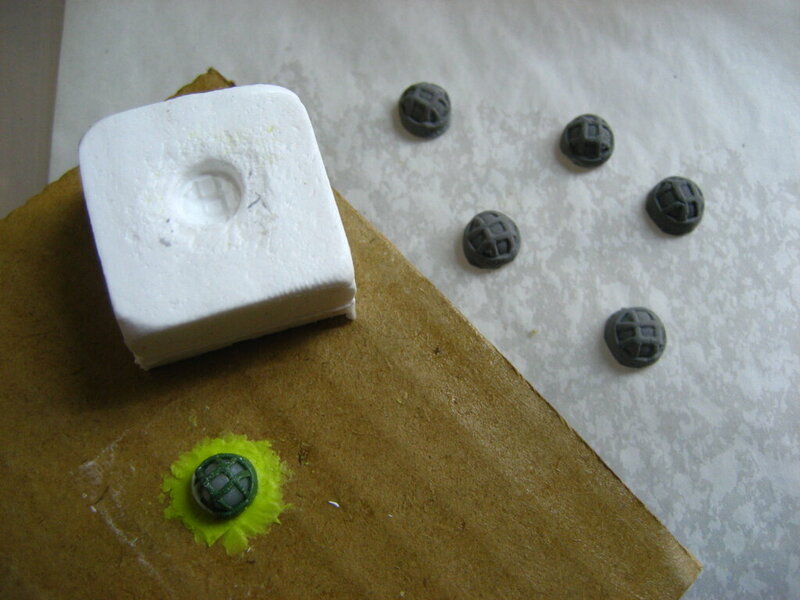 Now adding details using a mix of greenstuff and apoxie sculpt. I plan on finishing him up, then making two more casts of him to make the gunner crew. 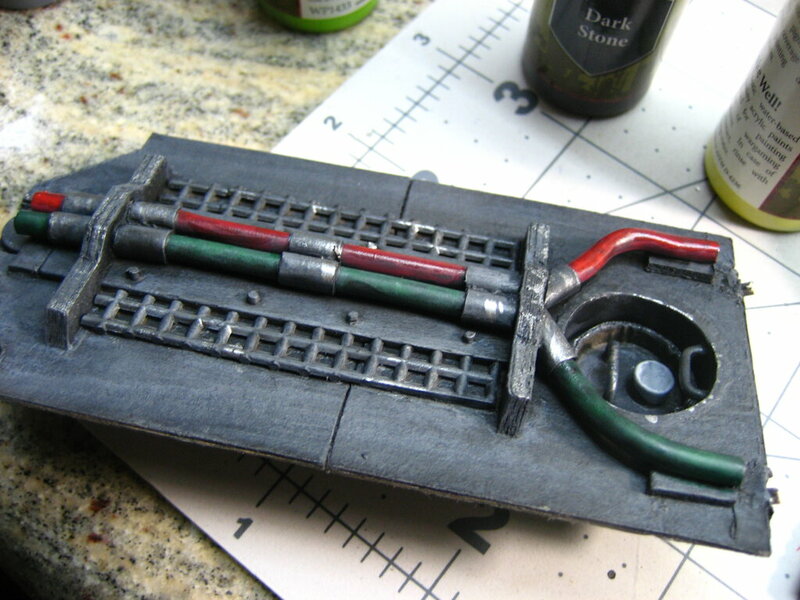 Some more progress on the pilot, plus I made a quick model of the caged lights that are so beloved on the Imperium wargear, then press-molded it with sculpey a couple of times. 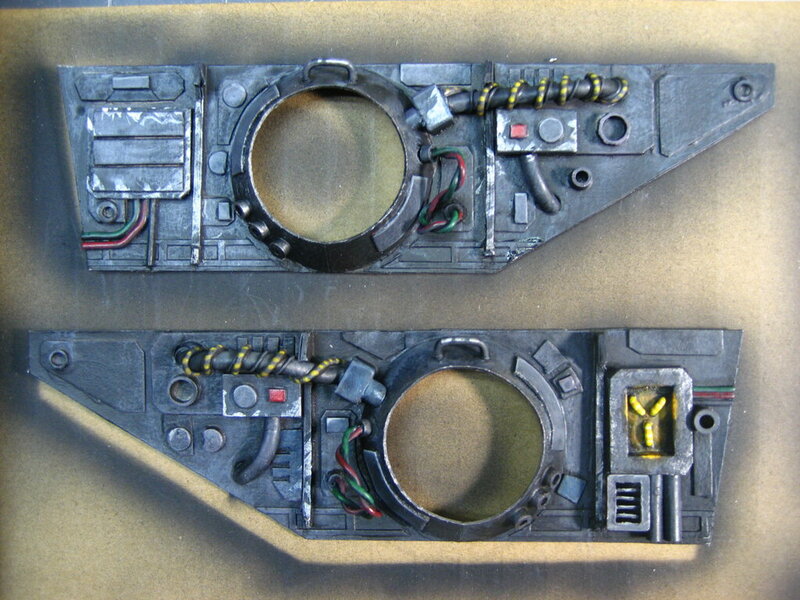 Here is the final pilot, ready to mold & cast into two gunners for the ball turrets too. Oh crap, the food just fell out of my mouth . Really amazing work. You're certainly multi talented. 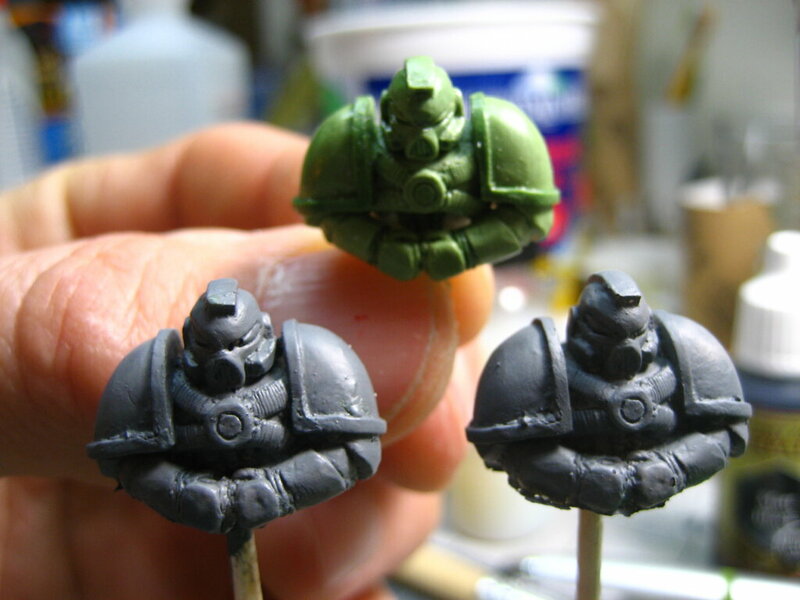 The space marine sculpt is wonderful. 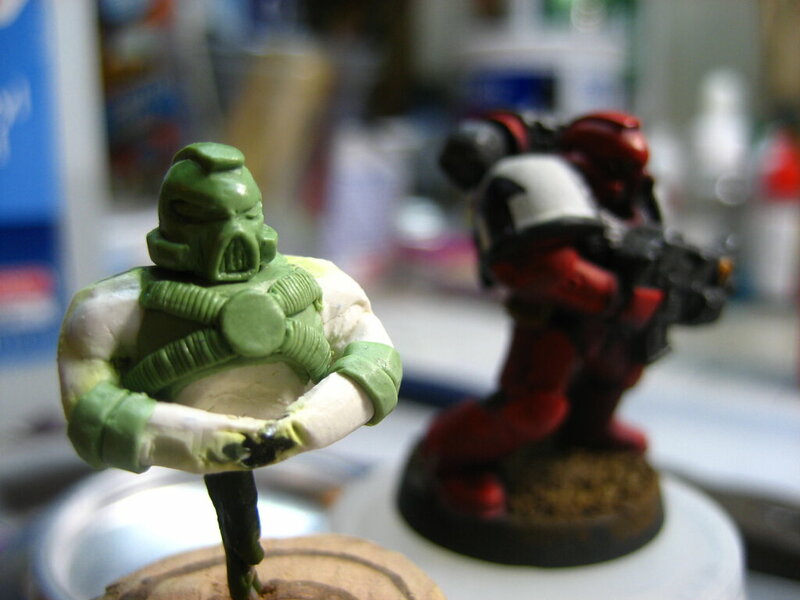 Yeah, the space marine was fun to sculpt. 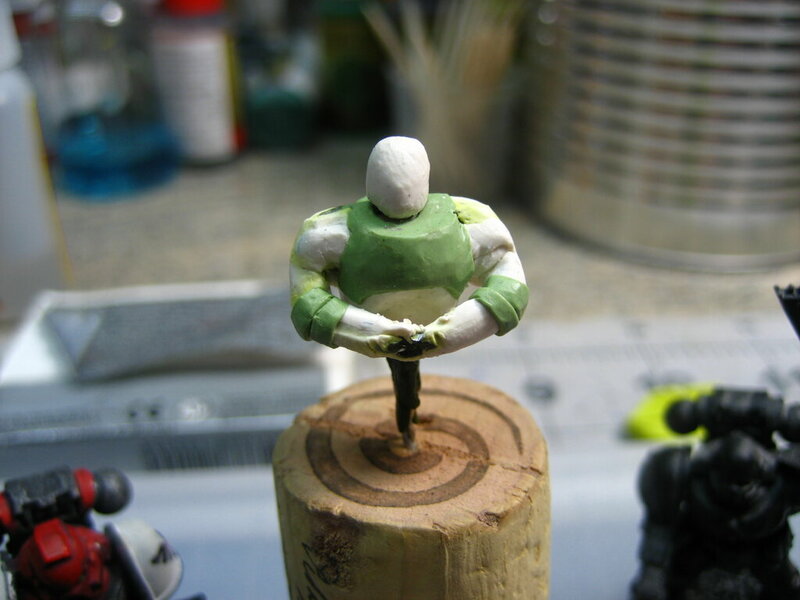 I've still have a fair way to go in doing proper mini sculpts, but I just need three of these guys, and they'll be fixed into their seats, so the torso + head just needs to look acceptable. 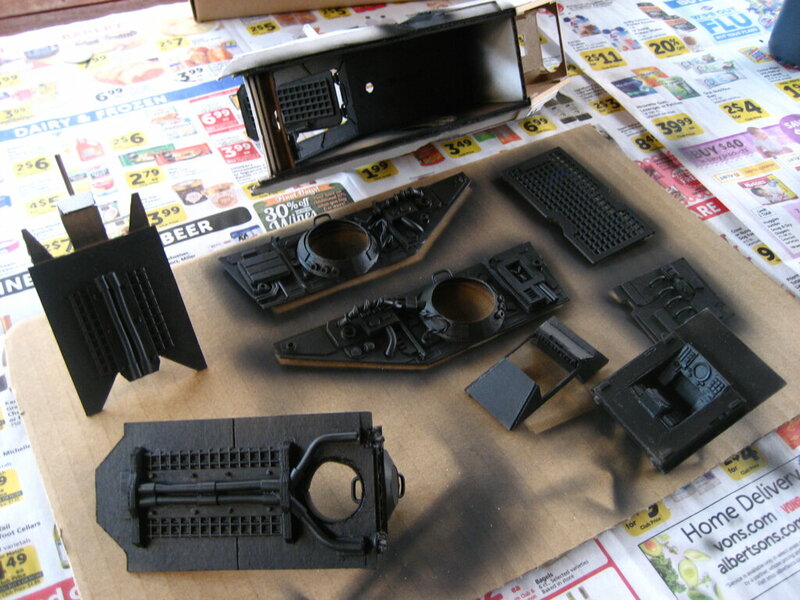 Pretty amped to get the interior done and onto the exterior again. 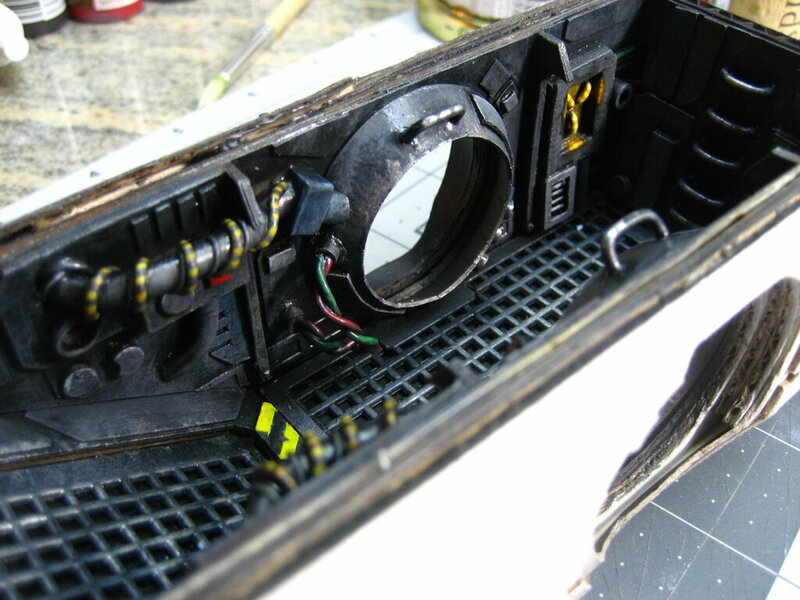 Here are some shots of the painted and glued interior. Unfortunately the exterior white of the model kind of ruins the exposure of the photos, but it is the best I can do right now. 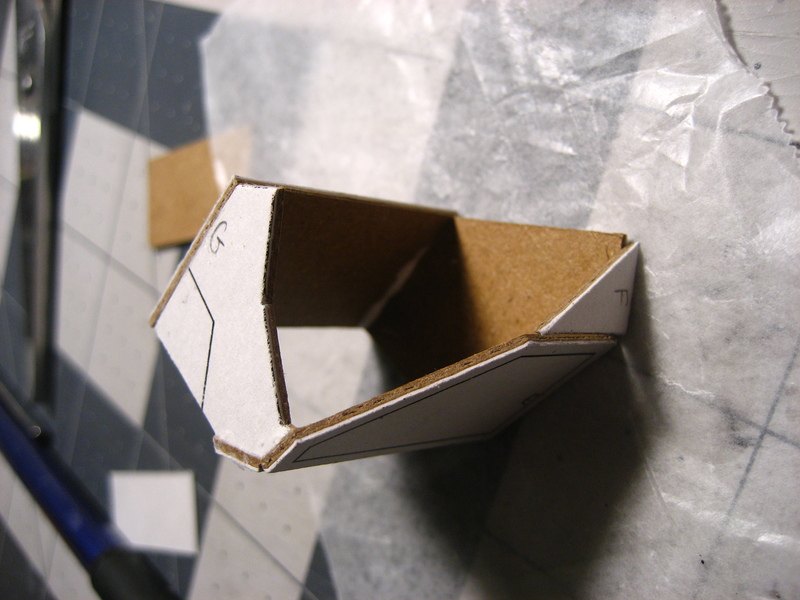 The rear 3rd of the body will have its ceiling/top glued into place, the front two-3rds will be removable. So some of the detail in the back will be hard to see, which is why I didn't spend so much time on those. The view from the rear hatch with the top hatch open. This was the effect I had in my head, and for better or worse I pulled it off exactly as I wanted it. 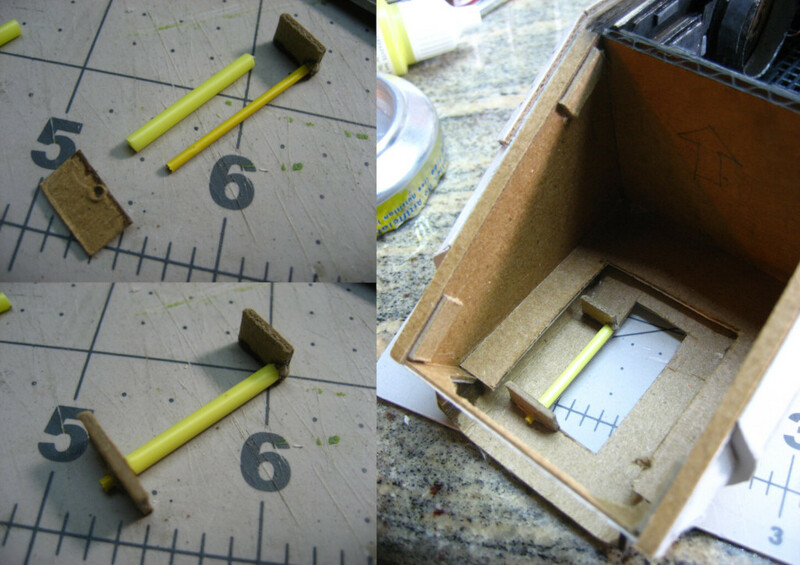 First up, I made a hinge for the door using a piece of paperclip, a plastic tube from a cotton swab, and some thick index card. 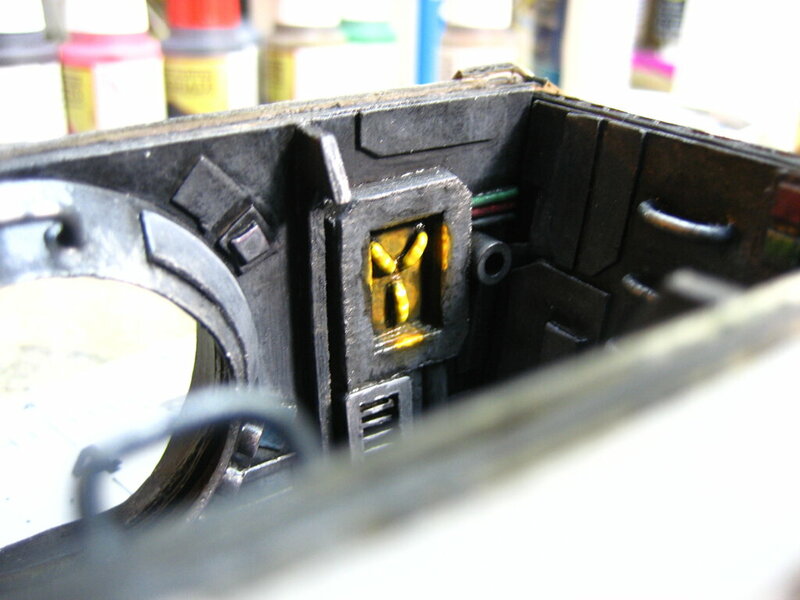 Next, I attached the door to the hinge. 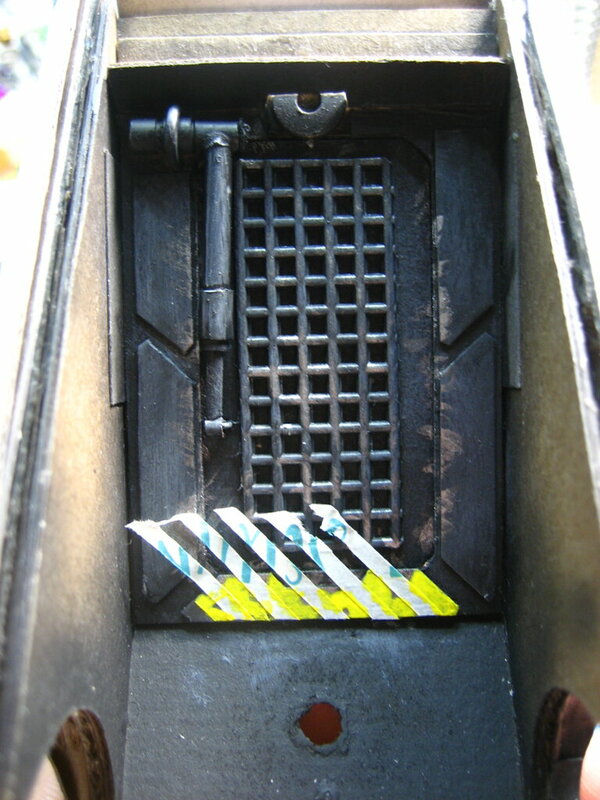 The hinge sticks out a little over the long edge of the door, that means the door (which was the actual piece cut from the bottom) hits the opposite edge when closed, forming a natural stop. The door will still get a magnet to make it stick in the closed position. 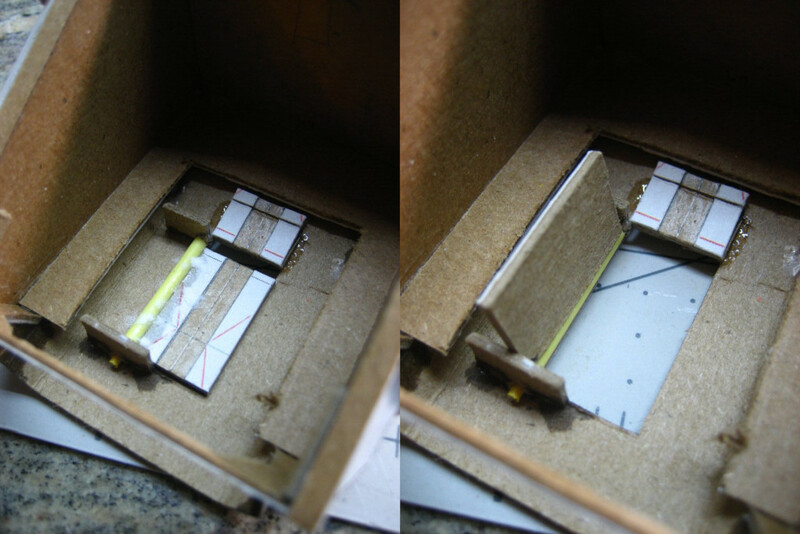 Aside: You may notice I cheated a little with the upward curving rear of the door. It is hard (possible but not practical) to have the whole door swivel, but I opted for a practical if not totally correct door. Pundits may also notice that in fact the Fire Raptor doesn't actually *have* gear doors: it has landing pads which act as doors when retracted. 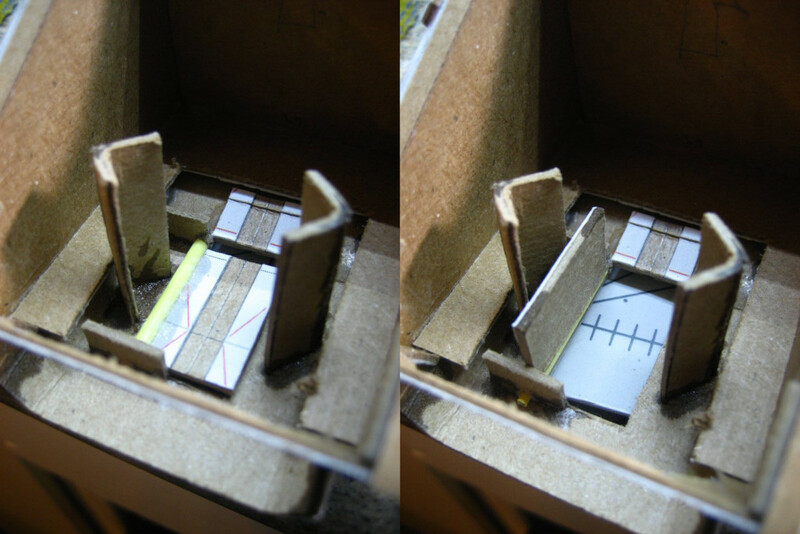 But I couldn't make this work, so instead I cheated: the closed doors will look like the retracted landing pads, and when the landing pads are extended the doors are hidden in the wells (which is why they do not open outwards). This gives the same effect at half the price. 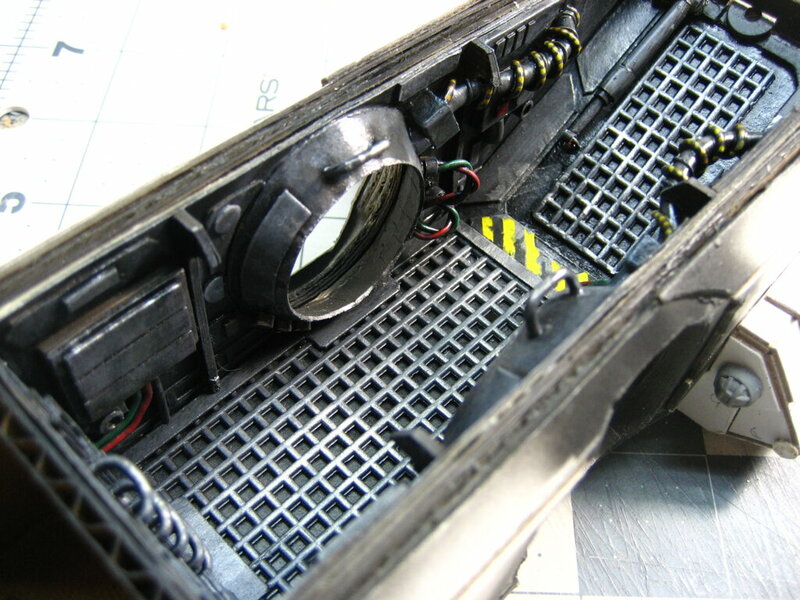 Finally, a visual check with (a) the doors closed and (b) the doors open and the landing gear struts inserted. The pads will go at the bottom of these. And another check: it looks like the landing struts can hold the weight of the chassis. 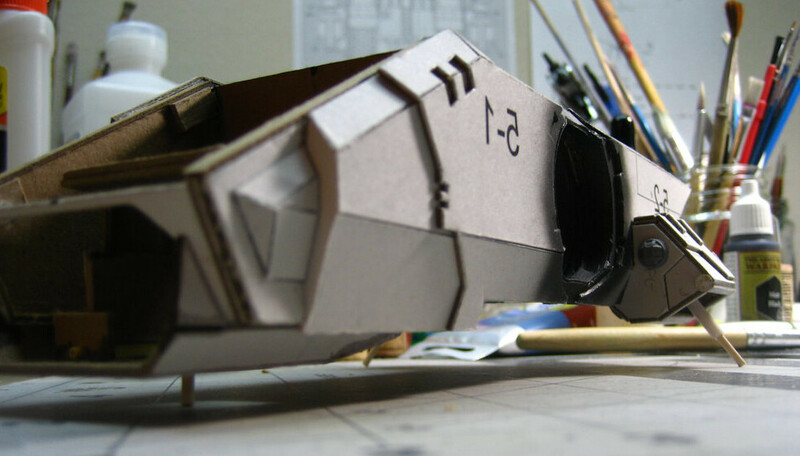 They will need reinforcement though, since I will add a significant amount of weight once the ball turrets, front cannons, wings, ceiling panels and control surfaces are added. 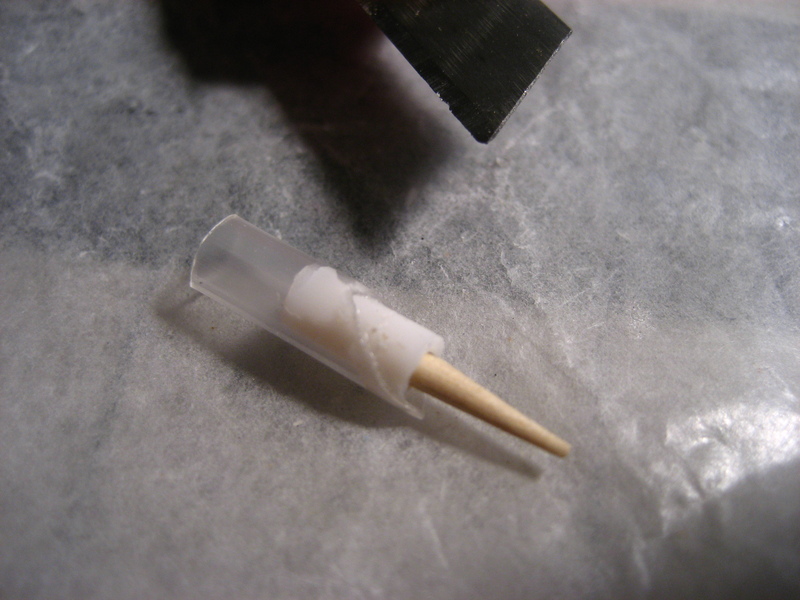 I made my usual guerilla-style mold from caulking silicone, so the casts are a bit rough, but nothing a bit of PVA can't fill. 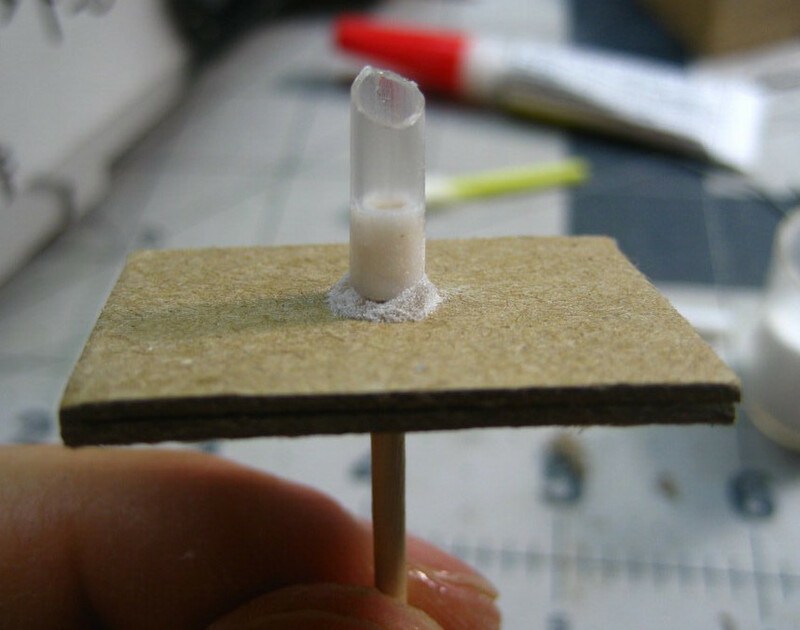 For the main pilot, I aim to cast him using some proper silicone, since he will be most visible.